France has called for a United Nations Security Council meeting on the treatment of migrants in Libya and will seek sanctions if Libyan authorities do not take action, French Foreign Minister Jean-Yves Le Drian said on Wednesday. Le Drian said he wanted the International Organisation for Migration and the U.N. Refugee Agency to publish details about the trafficking of migrants in the country. “Libyan authorities, who have been alerted several times, including by myself because I was there in September, have decided to open an investigation into the facts,” Le Drian said. “We want it to go fast and if the Libyan justice system can not carry this procedure through then we should open international sanctions,” Le Drian said during a question and answer session at the lower house of French parliament. Earlier, the AU, EU and the UN have agreed to work together to find an immediate solution to the migration crisis and the situation in Libya, Chairperson of the African Union Commission Moussa Mahamat. between the situation in Libya and the migration crisis, stating that because of the lack of governance in the North African country, criminal groups are thriving in Libya, including human traffickers. UN, so as to find an immediate solution, because people are under threat, people’s lives are under threat,” Mahamat. Earlier in November, the CNN published a report showing people that were being sold as slaves in Libya. Libyan authorities have reportedly launched a probe into the case. Libya has been suffering from turmoil resulting in the humanitarian and refugee crisis since 2011, when a civil war broke out in the country and long-standing leader Muammar Gaddafi was overthrown. National Army and based in the city of Tobruk governing the eastern part of the country. 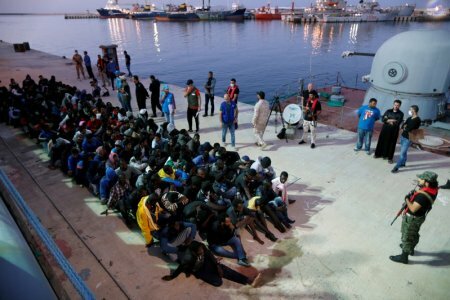 According to the latest data of the International Organisation for Migration, over 19,000 migrants have been rescued or intercepted in Libyan waters on their way to Europe this year. In the first 10 months of 2017, over 111,000 migrants have arrived in Italy by sea, with the majority of them coming from Libya. In the meantime, Ethiopia has received 103,263 new refugees in the first 10 months of 2017, making the total number of refugees living in the country to be 889,071, the UN Refugee Agency (UNHCR) said on Wednesday. Kisut Gebreegziabher, Assistant Communication Officer at UNHCR, told Xinhua that refugee arrivals in 2017 were dominated by South Sudanese, numbering 73,857, followed by Eritreans at 20,700 and Somalis at 6,600. He said “refugees from South Sudan fled to Ethiopia to escape civil war, Eritrean refugees mentioned indefinite military conscription and human rights violations for their flight, while Somalis mentioned a combination of conflict and drought for fleeing to Ethiopia. “The South Sudanese refugees’ total population reached 419,000, close to half of total refugee population in Ethiopia,’’ he said, adding that the South Sudanese refugees were mainly sheltered in Gambella and Benishangul Gumuz regional states. Gebreegziabher further said that UNHCR had been giving basic social services to the 889,071 refugees living in 26 refugee camps in six regional states of Ethiopia. The social services in the refugee camps include education, health, water and sanitation, food, nutrition support and community empowerment.